I’m not sure whether the concept of gratitude I’m going to share with you is radical or not but it certainly was for me. I was taught to be grateful for all the good things I had in my life. Not that I always was, but the concept was not new to me. So when I felt like grumbling about things and going ‘Why me?’, I learned to start looking at all I had and seeing how blessed I was in comparison to others less fortunate than me. Great idea, but it resulted in gratitude given grudgingly. Then when I started to get a little wiser (!) and things went wrong sometimes, I went from ‘Why me?’ to ‘Why not me?’ ‘Why shouldn’t things go wrong for me?’, I asked. I don’t deserve any better than anyone else. And again there was a comparison, ‘If things can go wrong for my friend, who definitely deserves better than me, why should they not go wrong for me?’ Can you see the folly of this? Guilt and comparison are not great for the soul, as I’ve since learned. Now moving to the radical gratitude stuff. Here’s my new mantra on gratitude: To be thankful when things don’t go right because I’ve begun to understand that everything does truly work for good. I’ve started to believe that every experience that we have, every mistake that we make, every choice we make, can lead to good, if we have the right attitude. This does not mean that we have the license to go about being thoughtless or careless. No, on the contrary, in my experience, an attitude of gratitude helps us to become more mindful of our choices, our words, our actions. A tough mantra to follow? Yes, at first. I haven’t completely incorporated this into my life. But now, when anything ‘bad’ happens, after my initial reaction of shock, anger, sorrow…….I stop and give thanks and then I affirm to myself that there’s a lesson in this and that everything works for good. It gets easier with time, like any habit. not any act, I would not bow to. What do you think of my gratitude mantra? Crazy? What is your gratitude mantra? I believe that it will always be okay in the end, if its not okay its not the end. And this keeps me positive even in adverse situations! This is a very serious soulmate moment for us Corinne.Nt only do I believe in this 100 percent. But also I extend it to another thing. I say that I have a certain share of bad karma in my life and that needs to be dealt with. So everytime something bad happens I tell myself thank go a part of it has got repaid. It is like I know something bad will happen to me for things I have done and when those things happen I can also say I am being let off lightly. I agree. Everything happens for a reason. And being thankful for something not being any worse than it already is, is a good thing. I am not thankful when things go wrong. However, even when things go wrong, there are some positives. It’s like every dark cloud having a silver lining. For example, if I am in some great difficulty, I’m not thankful for it. But, I am thankful that I have the support of people who help me get through that difficulty. As years pass, many of us turn cynical and bitter. Practicing gratitude helps us stay positive and filled with warmth and compassion. I am loving this entire series of yours, Corinne! Love the quote and Rumi as always is simply superb. I also believe that all things happen for a reason – sometimes it’s so we can learn something, sometimes it’s karma (balancing out). Life leads us to exactly where we are supposed to be. When things happen that are hard to bear or deal with I tell myself, “my soul needs this” – somehow makes it easier for me to deal with it then. I agree. I believe everything happens for a reason good and bad. From each thing we take something away from it. We learn from it and grow. It may be in hindsight but still there is learning and growth. Well said, Corinne! 😀 I’ve always been a follower of the “things could be worse” philosophy too. My favourite phrase though is “Whatever doesn’t kill you, makes you stronger”. 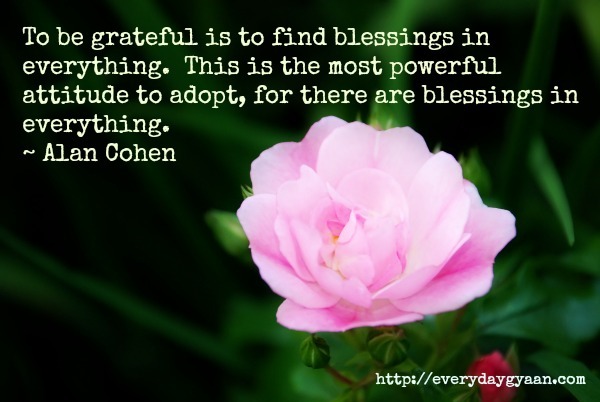 Yes, sometimes it helps to see that there is a blessing in everything. But it will help when it truly feels that way. I often repeat to myself that whatever happened is for good only, but it probably lacks conviction, and I keep going back to comparing my life with others. Maybe I’ll get there, when I truly feel the blessing in my loss, slowly, in time. St. Paul tells us to be grateful in all circumstances. No, it isn’t easy to do, but, like you, Corinne, it’s something I continue to work on in my life. Having a gratitude attitude is all important and we can learn so much from those seemingly “unfair” lessons. CO-incidence that this happened at a tiime when I learnt once again what being greatful means? Corinne I really appreciate your spirit. The last paragraph is truly inspiring. ” when anything ‘bad’ happens, after my initial reaction of shock, anger, sorrow…….I stop and give thanks and then I affirm to myself that there’s a lesson in this and that everything works for good. It gets easier with time, like any habit.”. It is difficult to practice it. Only with a great will power it can be practiced. I like your radical mantra Corinne 🙂 And i believe too yes that things happen for a reason…if they aren’t as pleasant or as expected then we should be grateful for the lessons. Everything for a reason! Well said, Corrine. In tough spots, it’s hard to see that others are in tougher ones……till we are are reminded.